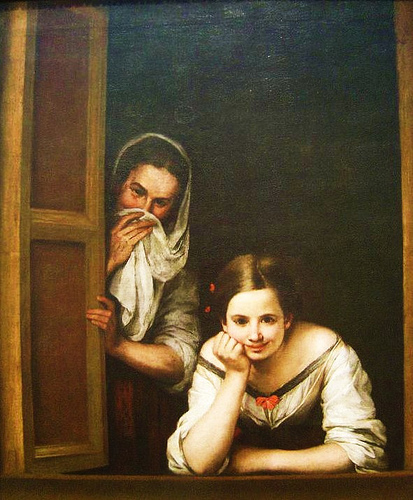 According to noted art historian and Murillo's biographer, Jennie Ellis Keysor "It was in middle life that Murillo began painting the subject that more than any other distinguished him. It was to glorify a beautiful idea, that Mary was as pure and spotless as her divine son. It is called the doctrine of the Immaculate Conception, and so much did it appeal to Murillo that he painted it over and over again. He has left us at least twenty different pictures embodying this doctrine. The one most familiar is perhaps the greatest. It is the one that now graces the gem-room of the Louvre. I so name this room, for in it, within a few feet of one another, are pictures by Raphael, Da Vinci, Correggio, Rembrandt, Veronese, in short, by the foremost masters of the world. Among all these the vision of Murillo takes an equal rank. To many, the idea which the picture represents is of secondary importance, save perhaps as giving a reason for the name it bears. But all can see the exquisite loveliness of this young woman in her blue mantle and her white robe, with her feet concealed by the voluminous folds of her drapery, and with the crescent moon, the symbol of all things earthly, in the midst of a throng of child-angels “hovering in the sunny air, reposing on clouds, or sporting among their silvery folds”—“the apotheosis of womanhood.” It is as if an unseen hand had suddenly drawn aside an invisible curtain and we, the children of earth, were for a moment permitted to view the interior of heaven itself. In this vision of a poet, so masterfully painted, the lover of pictures rejoices."